it's snowing outside creating a world of beautiful white. It has been snowing since yesterday and there is close to 2 feet of snow outside. so it has been a lovely treat having extra time with him. My son is having a blast in the snow - here is a picture of him "diving" into the fluffy white stuff. In the picture below is a large trampoline....can you find it? but I think you get the idea that we have A LOT of snow here in the Rockies! Love to you, my friends! Have a beautiful weekend filled with plenty of joy! I thought I would show you a fun game I made for my son to play on Valentine's Day. I gathered up 6 cans, felt, rice, and voila! I had a game ready. . .with some preparation, of course. Here is what I did. . . I collected the cans and then I cut strips of felt to wrap around each one. (small enough to go in the can) and filled each one with rice. I cut out circles to write something special on them like, "One piece of Valentine's candy"
and glued the circles onto the bottom of the cans. he will be surprised by the message on the bottom. and since my family and I are in a new home I thought my dining room needed a little "love." So I made a pretty garland to hang on the china hutch. Punch out 15 hearts for each heart flower. Punch out a circle and apply 4 hearts with glue. Next add 5 more hearts. Then add one heart to the middle and add an embellishment, if you so desire. Make as many heart flowers as you like - I made 5. Now cut a strip of lace to the desired length. Loop a piece of sting through the lace and glue the ends to the back of the heart flower. such as clothes, food, fuel for the car, laundry soap, etc. even when it might seem impossible. and this verse popped into my head, "...my God shall supply all your need." God was gently telling me that He would provide the patience that I needed for that moment. are all "needs" that will be met by God. yet God promises to "supply all your need." then he will have every need met." "...My grace is sufficient for thee: for my strength is made perfect in weakness." It is God's provision for our every need when we need it. There is never a shortage of grace. as well as our physical needs." and to do so with precious grace. and pushed myself out of the way to let Him supply my need. and I have filled it with new items - yay! I hope your day has been extremely nice, blogging friends. Take care and have a delightful weekend. 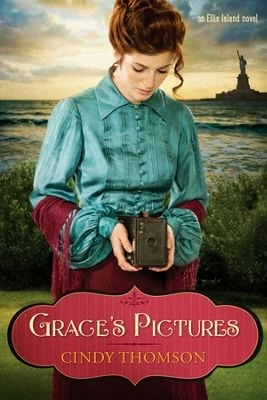 Grace is an Irish young lady who travels the ocean to find a new life in America. and so begins her interest in still pictures. to be able to take snapshots of memorable moments. and has a run-in with local gangsters called "The Dusters." Grace is hesitant to seek help from the New York Police department. but Grace has a hard time believing he is genuine. but is somewhat confused by her cold and disinterested attitude towards him. that she's had to deal with all of her life. to learn the true meaning of courage and forgiveness. and then when I read the back cover I thought for sure this would be a great read. "Will I ever finish this?" and having to deal with dishonest cops. are just as crooked as they were in Ireland which gives Grace a low-view of men in general. so that by the time they do realize their feelings for each other it seems a little forced. Grace is offered a position with a family, the Parker's, that has many "issues"
to the father wanting his family to not be failures and not show emotion. and begins to discover herself; she begins to see that she can be strong when she is scared. For me, they were not quite believable. The characters just didn't quite add up to what a gangster would have been like back then. All in all, I would give this book 3.5 stars out of 5. For me, the story fell flat. They can be tart right now, but sometimes they can be fairly tasty. Besides, just a little bit of sugar makes everything sweet, right? Preheat oven to 350 degrees F and grease a 9 x 9-inch baking dish. Stir 1/2 cups of sugar with the flour and baking powder in a mixing bowl. Stir in the milk, butter, and vanilla until a batter forms. Add the blackberries and sprinkle with 1/2 cups of sugar. or until the batter has risen and the top is golden brown. I made this cobbler for Thanksgiving and it was quite the yummy treat. Have a beautiful and blessed day, lovelies! the Book widens and deepens with our years." and of the joints and marrow, and is a discerner of the thoughts and intents of the heart." for a whole week - hallelujah! and I am definitely having fun "fluffin' and featherin'" as a dear friend of mine would say. and I thought it was high time for a post on the blog. and thought I would make my son and myself some since I am always cold! They are also a cinch to put together. Cut four pieces of fabric that is 4 x 4 inches. Leave a small opening for turning the square right side out. Before you turn the square right side out, you may want to trim the corners. Now turn the square right side out and press with an iron. Fill the square with rice. but for this I am just using the machine. and you're ready to keep your hands cozy and warm. May each one of you have a beautiful weekend. It's a joy to my heart to read your kind comments - thank you for being a blessing!